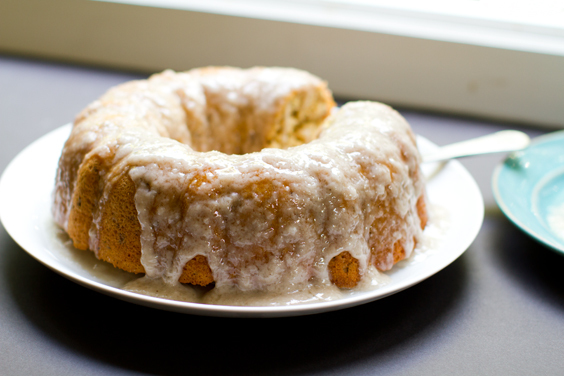 Coconut Bundt Cake. Moist. Glazed. Vegan. 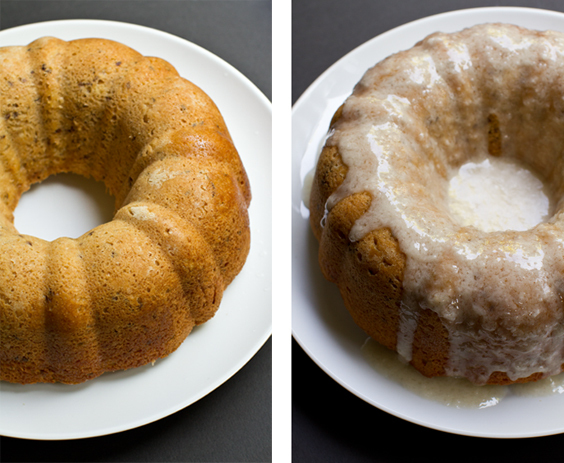 This is my first Bundt cake recipe post. Probably because until a few weeks ago I never owned a Bundt pan. 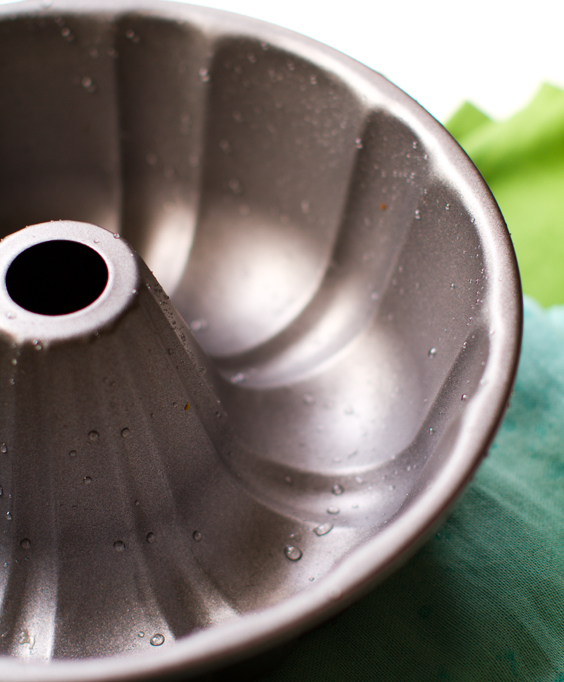 And if there is one thing you do in fact need to make a proper Bundt cake - it is a Bundt cake pan. My first Bundt cake: Vegan Coconut Bundt Cake with a glossy Coconut Glaze drizzled over top. Moist in texture with a spongy quality. 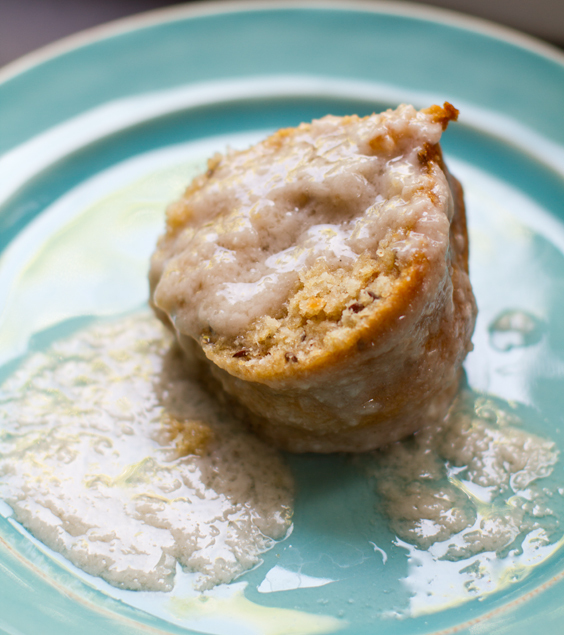 Serve it warm and moist, the glaze shiny and wet - as shown in my photos. Or serve chilled and allow the cake to firm up, gaining rich body - the icing turning to sweet, opaque, snow-colored velvet - buttery in texture. In Awe of the Bundt Pan. Think about it, besides the ever-popular "cupcake" - what common baked good requires a very special pan in order to create it? Brownies and layer cakes can work in a wide variety of square or round baking vessels - and a nice multi-purpose bread loaf pan can make everything from banana bread to a sourdough sandwich loaf. But the Bundt pan is so unique - it is its own baking event really. And baking a Bundt cake inspires a retro, 1950's tea-time, celebratory, social vibe, for good reason..
History of the Bundt Cake/Pan. As much as it might seem that the Bundt pan was magically invented in the iconic American era known as "The 50's" - it wasn't. Well, sort've. 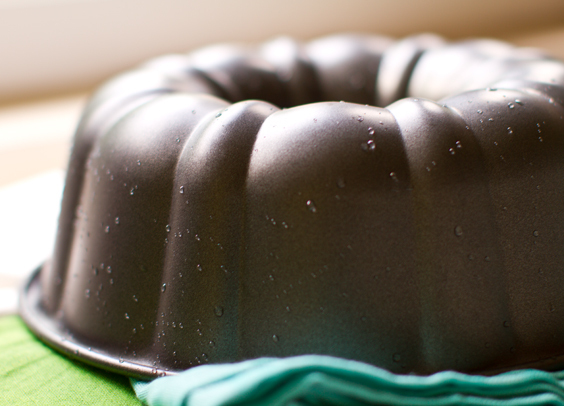 The Bundt pan was trademarked in 1950 by H. David Dalquist, founder of Nordic Ware, based in St. Louis Park, Minnesota. The actual origins of a Bundt-style pan traces back to the other side of the world - Germany, Austria, and Hungary really. So what do you know, the infamous American Bundt Pan (like most of our ancestors) is an immigrant. Actually the Bundt Pan/Cake frenzy was very ahead of its time. Like those silly-tastic cake pops, foods in-a-jar and green smoothies - the trend of "Bundt" was a sign of the times - and occurred via some crafty marketing mixed with some serious 1950's word-of-mouth appeal. You can thank 1950's women for giving this trend legs. This was the era of the Tupperware Party. 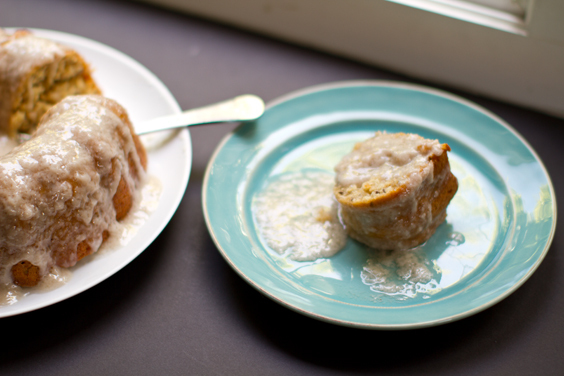 Bundt cakes were another hot trend floating around the neighborhood social circles. I keep picturing scenes from Pleasantville and The Help. I can just see it .. the "ladies who lunch" sipping tea and coffee in flowery pastel dresses, hair combed in rigid hair-sprayed outward loops - frosty pink lipstick on their excited mouths as they swapped Bundt cake recipes and bragged about how many slices of their signature Bundt recipe their husband's devoured after supper. Oh if only those ladies had Pinterest. But since social media was still a half century away, we have to thank big business for igniting the Bundt cake frenzy. The trend was sparked when Pillsbury sponsored a Bundt Cake Cookoff - also around that time, a pound cake (which everyone already knew and loved) was cooked in a Bundt pan and placed in the pages of the Good Housekeeping Cookbook. Boom. Bundt was born in American culture. And the Bundt trend continues. My post is proof of that. 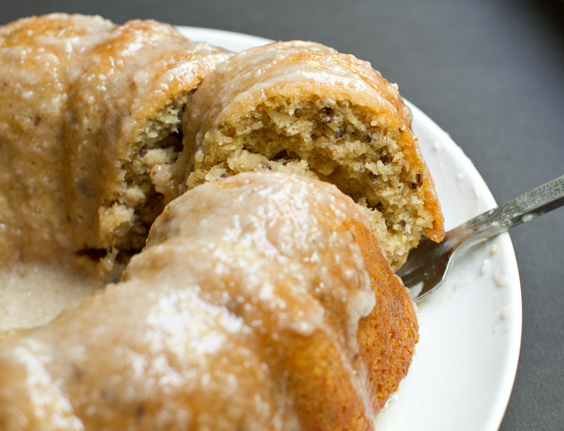 I must admit that there is something charming about a Bundt cake. The soft ridges in the cake, the signature doughnut shape, ideal for easy, uniform slicing. 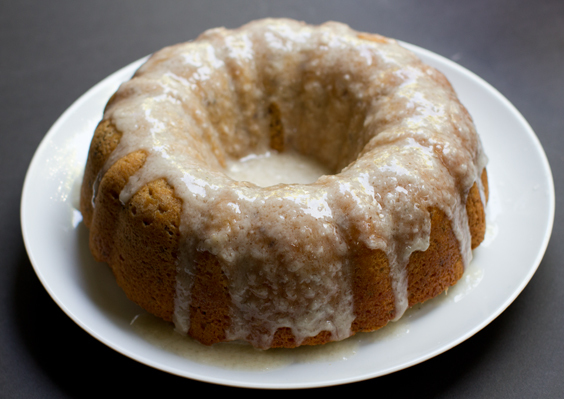 The appealing slim cake lines that allow glazed frosting to melt and curl over, swooping down in a shiny sugar puddle. So enough Bundt chatter ladies (and fellas - yay to how times have changed in the kitchen), lets pop a Bundt in the oven, steep some tea, brew some black coffee, lay out our best linen tablecloth and turn up the The Chordettes version of Mister Sandman .. Bung, bung, bung, bung, bung, bung, bung, bung, bung, bung, bung, bung, bung. 2. 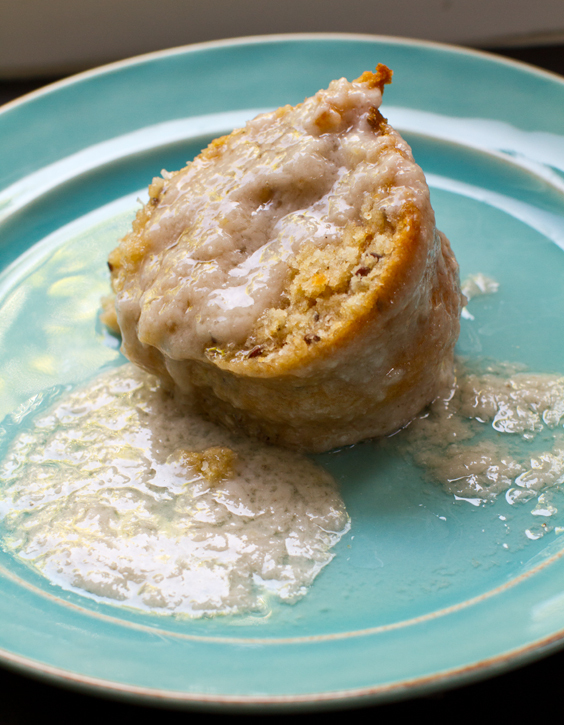 Grease your Bundt pan with virgin coconut oil. 3. Combine the dry ingredients in a large mixing bowl. 4. Briskly stir the flax seeds with the 1/2 cup water and set aside. 5. Gently beat the wet ingredients - all except the flax mixture and apple cider vinegar. You want your virgin coconut oil to be soft enough to smoothly blend into the other ingredients - all should be about room temperature. 6. Fold the flax mixture into the wet ingredients. Stir until smooth. &. Fold the dry mixture into the wet. Until smooth. Then fold in the apple cider vinegar last - it is OK if it is chilled. 7. Pour mixture into Bundt pan. 8. Bake at 350 degrees for 50-60 minutes or until the top is bubbled and browned - use the toothpick test if needed. 9. Allow to cool a good 20 minutes before attempting to remove cake from pan. set aside to cool. 10. 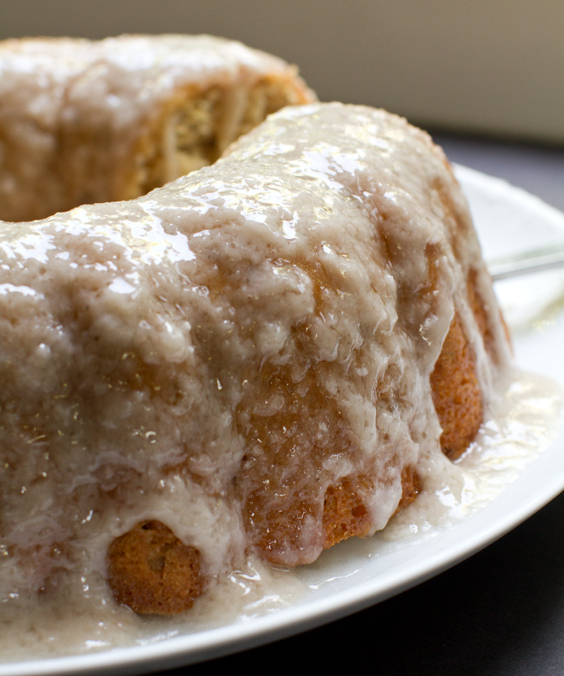 Beat together your coconut glaze. You can adjust the basic ingredients to suit however thin or thick you like your glaze. 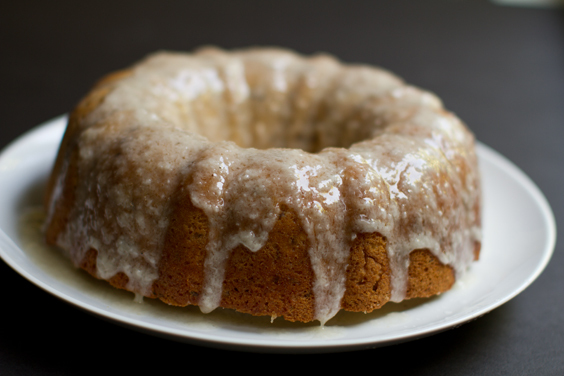 Note that since you are using coconut oil, the glaze will firm up when chilled - so it is OK if it seems watery or oily upon pouring over the Bundt cake. 11. 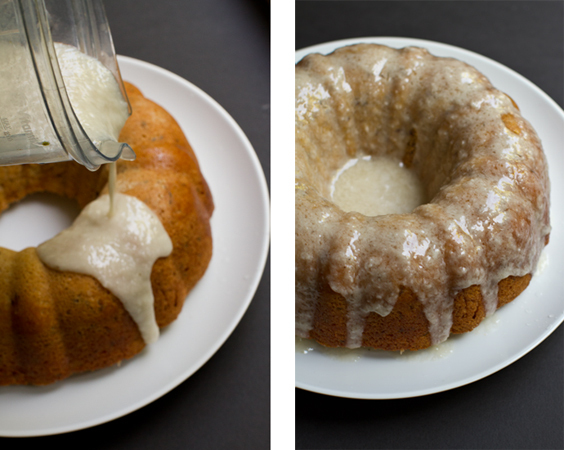 Pour glaze over top cake. 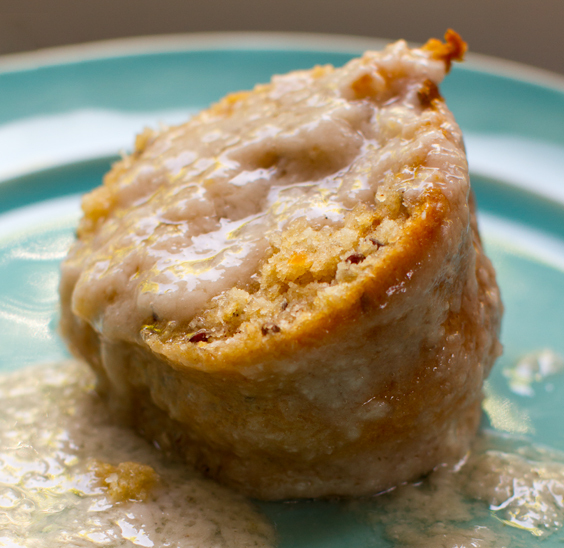 Serve warm and 'wet' or chill in the fridge and serve cool and buttery. Happy Bundting! 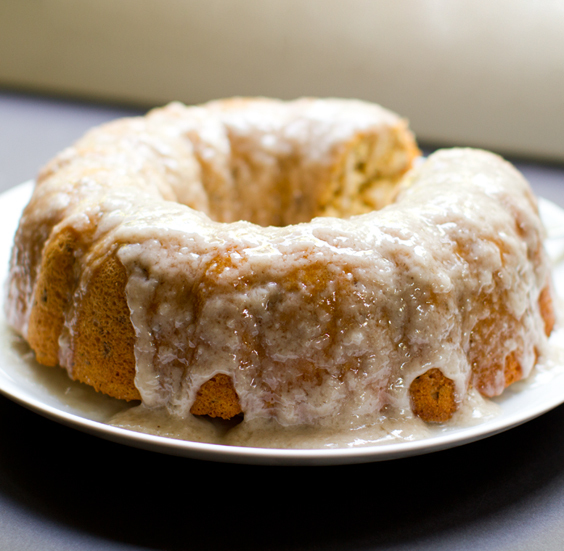 What is your favorite Bundt cake recipe?